Summerfields Friendly Village is conveniently located just off the Black Horse Pike in Williamstown, New Jersey. Here you’ll find an all ages community of thoughtfully arranged manufactured homes along tree-lined streets with activities from the community clubhouse to the Olympic-size outdoor pool to short rides that place you in interesting locations like Historic Smithville. 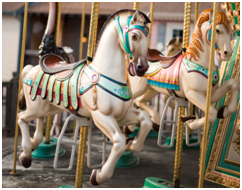 The Painted Ponies; another name for a carousel; spinning magic with brightly colored wooden horses, mirrors, lights, and carnival-like organ music. In 2000 the Fitzgerald’s, owners of the Village Greene portion of Smithville, purchased a 20 foot carousel. Although Smithville had always been known to have a carousel. But when the Fitzgeralds purchased the Village Greene all that remained of the carousel was a large round flat area of platform of concrete where the carousel once stood. Beautifully detailed, the carousel horses at Smithville New Jersey are works of art. The Fitzgerald’s ordered the distinctive carousel from Wichita Kansas all of which made the children and everyone else in the area “happy campers.” What’s more there have since been wedding parties and prom couples that have taken photos with the carousel. 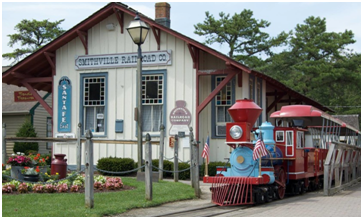 The Smithville Train is great fun for families and children of all ages! Catch a glimpse of everything Historic Smithville offers as you enjoy an enjoyable railway experience. Historic Smithville hosts a Children’s event every Spring. It’ is a day full of family fun and activities for all ages! Popcorn, face-painting, balloon animals, train rides, and games are just some of the events to look forward to! Admission to the Children’s Festival is free, while there are some free activities, others will have a small fee. Summerfields Friendly Village is conveniently located just off the Black Horse Pike in Williamstown, New Jersey. Spacious living and dining rooms with state-of-the-art kitchens and low maintenance exteriors make life casual and enjoyable. Each of these manufactured homes comes with a storage shed and can be customized to meet each homeowner’s individual needs. Summerfields Friendly Village is a community of 600 home sites and is situated in the heart of the New Jersey Pinelands. There are virtually no closing costs. Modular construction uses less material without compromising a building’s structural integrity so you support green initiatives.